Lace and off the shoulder – two trends I can absolutely get with. Even though “off-the-shoulder” is a trend, the little white dress for summer is a classic staple in any closet. After I got married, I buried the white dresses in the back of my closet and moved on to bolder and brighter things. 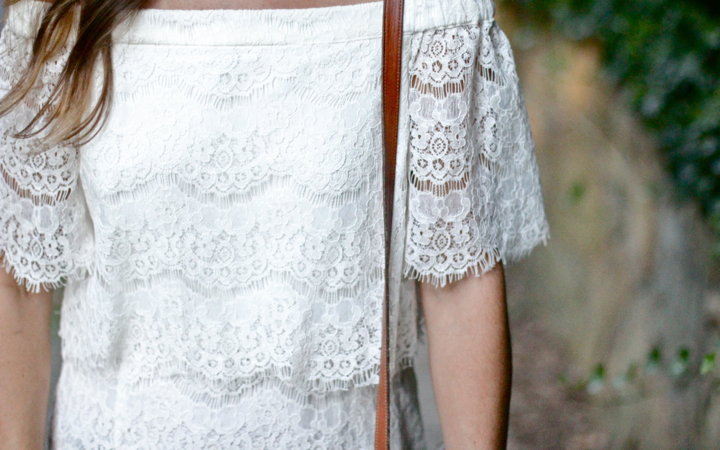 Until this dress I’d forgotten how fun it can be to put on a simple, feminine, white lace dress. Also- I’ve been living in these sunnies from Ditto lately. Ditto rocked my world when I found out you can essentially buy designer sunglasses (ray-ban, Karen Walker, Illesteva, etc…) for $19 a month and trade them out whenever you want – I’m sorry, what!? Thank you. I LOVE sunglasses (hence the title of this blog) because they 1) have a function – they block the sun, duh.. and 2) they totally change anybody’s level of swagger haha. But sometimes they can be an investment. It was so fun virtually trying on sunglasses (p.s. they have prescription eyeglasses too) and picking based on my virtual try-on. On the way back from the Dominican Republic we left at 4 a.m. and since mornings are not my thing (understatement of the century) I wore my sunglasses on the plane, sat down in my seat which was in an exit row, and was out in two seconds. I woke up to the flight attendant saying: “mam, mam, I just gave the instructions for your exit row – did you hear and understand them?” “Oh yeah yeah, I got it” I said – but it definitely reminded me of Kristin Wig in her sunglasses on a plane. Thank you SO MUCH for reading and have a happy hump day!